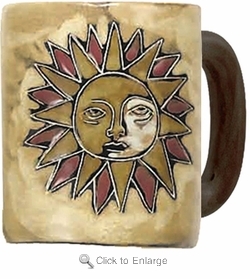 Mara Mug - Suns 9oz only $17.83 - Mara Mugs 9oz. Mara Stoneware Dinner Cups - Sun have the design centered in the middle of the stoneware dinnerware cup to give a massive view of the artful sun. This goes with Mara Dinnerware Set - Suns. You can see all Celestial theme products here Celestial.